Plantation forestry is recognized as a raw-material base for industrial and domestic wood products, which provides renewable energy, fiber and timber. Because of the growing global demand for forest products, higher yields and uniform product quality are needed. In terms of environmental issues such as global warming and climate change, the requirement for forest protection and biodiversity conservation is increasing. Especially, the biodiversity conservation is a global concern because biodiversity has declined by more than a quarter in the last 35 years. Plant tissue culture enables the production of plants with superior characteristics and uniform quality for different uses of forest biomass. These techniques are currently in use for the large-scale propagation of important tree species and the sustainable conservation of rare and endangered plant species. The biotechnological methods such as plant cell culture, organogenesis, somatic embryogenesis, and cryopreservation are quite applicable and useful for the conservation and sustainable utilization of forest resources. This training workshop on basic laboratory techniques in plant tissue culture was successfully organized by APAFRI and the Division of Forest Biotechnology, National Institute of Forest Science (NIFoS) on 10 - 14 September 2018. 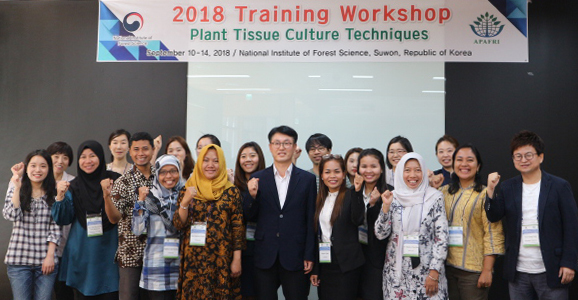 The workshop was designed to provide plant tissue culture techniques for the relevant scientists from the developing countries of the Asia-Pacific Region. The workshop included specialized techniques for direct and indirect organogenesis, somatic embryogenesis, micropropagation for large scale multiplication of plants, and cryopreservation of plant cell cultures. The workshop was attended by eight participants from APAFRI member institutions: Institute of Forest and Wildlife Research and Development, Cambodia; Forest Research, Development and Innovation Agency, Indonesia; University Gadjah Mada and Kasertsart University. Ms. Nazratul Rauzah represented APAFRI in this workshop.